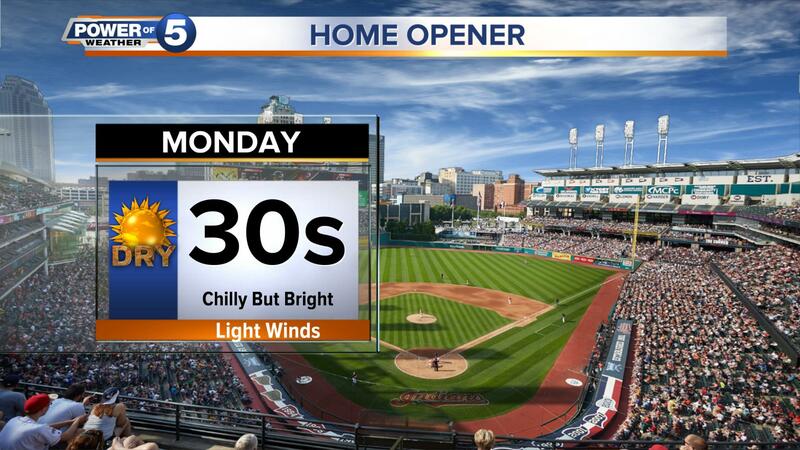 CLEVELAND — With the Cleveland Indians Home Opener on April 1, the excitement of baseball season is in the air, and so is less-than-desirable weather for the big day. As Clevelanders, we know this doesn't mean "Baseball weather" is right around the corner. We've been known to have to reschedule or relocate the first games of the season. Mother Nature tends to have her own plans when it comes to spring in Ohio. Typically, early April highs are in the lower 50s with mornings in the middle 30s. Although, our records are 83 degrees and 10 degrees, respectively. Needless to say, we'll be in between those numbers. In all honesty, plan on a chilly but sunny day. High pressure settling in early next week. That's good for our sky. Not so good for our temps. Stay informed and up-to-date with our forecast here.